One thing that enabled early humans to survive was their ability to quickly make assumptions about other people. Those assumptions caused us to act in a way that protected our tribe and ourselves. I believe the more pessimistic early humans were most successful. Just imagine that you’re huddled around a fire at the back of a cave and you hear a lion roaring outside. It’s the guy who is optimistic about his chances of killing the lion who goes outside and gets killed. All the pessimists hide deeper in the cave. Our cave dweller ways are ruining our workplace relationships. In today’s workplace, we often make pessimistic assumptions about the people we work with even though our ancient preference for pessimism can ruin our workplace relationships. Here are some helpful assumptions. It’s always best to first trust someone and be disappointed, then to mistrust them too soon. In the workplace, most people can be trusted with most things. Only the most sensitive information needs to be protected. If I believe that someone can’t be trusted, I will hold back information and avoid him. Since we often mirror the behavior of others, he’ll start treating me the same way. Mistrust begets more mistrust and, before you know it, other people will notice our behavior and start mistrusting us. Why, because other people need to decide who they can trust. They need to decide if they can trust me, my coworker or neither of us. If they see mistrust, they’ll likely pick a side or avoid both of us. At one company, I was part of a project to review training programs and determine if any changes were required. The project manager began the kick-off meeting by explaining the steps we were to follow and what would happen if we didn’t complete each step. She frequently name-dropped her VP and emphasized how important the project was to her VP. During the meeting, many of us formed the belief that all she really wanted was to show her VP that she could force people to comply with her process. The impact of her behavior was disengagement all around. Throughout the project, we all politely complied with her process. Although changes to the programs could have been made, little was suggested. Even though the outcome was the status quo, the project manager was satisfied with our compliance to her process. Most people already want to do good work. However, if they believe they won’t be appreciated, they’ll likely do the minimum, as fast as possible, and save their good work for someone who cares. 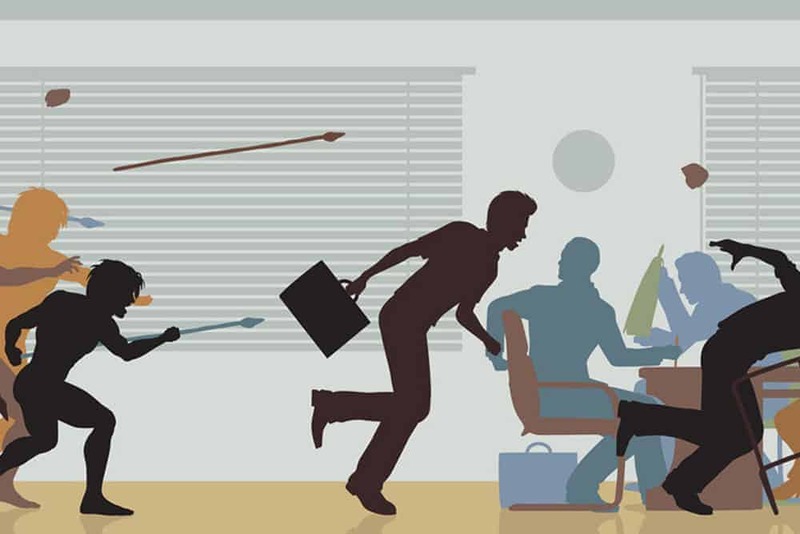 Very few people are unaffected by workplace conflict. Research shows that nearly all conflict has a negative impact on relationships; you can read about this in an earlier blog. Also, since we are programed to mirror the behavior of others, if people behave negatively toward you, you’ll probably, in a passive or active way, do the same to them; and everyone will likely feel bad about it. But, if you are pleasant and supportive, people will usually act the same way toward you. We seldom get what we think we deserve or exactly what we want, but we always get what we create. When I remember that most people are trustworthy, want to do good work and get along, I am able to squash my caveman pessimism and create positive workplace relationships. Although I’ve never had real lions in my workplace, for most of us, it’s perfectly safe to go for a long walk outside of the cave.